Recycling: Can it be bad for the environment? Many people make a huge fuss about recycling and think that they are doing the most wonderful thing for the planet. The truth is that recycling and reusing can make a huge difference in making the environment cleaner, but it also depends on how waste materials are being recycled. It may surprise you to know that recycling may not be as beneficial to the environment as you first thought. This is because recycling is no longer a small operation anymore. It has become a huge business that goes up and down according to supply and demand. How is recycling bad for the environment? Contamination spreads: This is something that many people do not think about. When certain materials that have lead paint and other toxins are recycled, the toxins get transferred on to the recycled products such as soda cans. Another example of this is gamma radiation poisoning that people in Taiwan are suffering from due to the use of recycled steel in buildings. Causes air pollution: This pollution is one of the major environmental concerns and sadly, it is still a problem today. You may be surprised to know that the process of recycling is a major contributor of air pollution. Exhaust from trucks that transport recyclable materials and the energy that is used in recycling plants emit toxic fumes into the air. About 179,000 garbage and recycling collection vehicles were on the road in the year 2009. Each vehicle’s exhaust was reported to contain more than three dozen types of airborne toxins. You can imagine how much damage is done to the environment with that amount of toxic emissions. Paper sludge remnants: Recycling paper is one of the most common green practices in the world. However, when paper is recycled, the process filters out waste substances such as ink, dyes, paper fibers, cleaning chemicals, etc. This waste is known as paper sludge. This sludge is disposed in landfills or burnt. This is one of the biggest contributors to the pollution of water as large amounts of heavy metals and toxic chemicals seep into the groundwater. Limitation of recycling plastic: Another huge environmental concern is excessive use of plastic bags and other items all over the world. The sheer number of plastic items in landfills is scary. What is even scarier is that out of about seven different types of plastic, only two types can be recycled. Recycling plants sort through the collection of plastic and sort out the ones that are recyclable and those that are not. Plastic that cannot be recycled is immediately dumped in landfills. Did you know that approximately 300,000 tons of plastic shopping bags are dumped in landfills annually? This is because the process of plastic recycling is expensive. Toxic chemicals from oil refining: One of the ways that people try to minimize damage to the environment is by recycling used oil. However, this recycling process creates many harmful chemicals that pollute the air. The most common process used for oil treatment is the acid clay process. Yes, it does remove the impurities in the oil, but leaves behind toxic impurities as well as harmful chemicals such as hydrochloric acid. This waste is then burnt as a method of disposal, emitting sulfur dioxide and nitric oxide into the air. This is proof of how recycling oil does more harm than good to the environment. Recycling does not minimize demand: There is always a huge demand for recyclable products all over the world. The sad truth is that this demand cannot be met by recycling. You can take aluminum as an example. The demand for this material increases by almost 10% every year. What this means is that mines still need to produce new aluminum, especially since recycled aluminum cannot be used for certain applications. For instance, soda cans that have been recycled cannot be used for the building of airplanes due to their quality nor can they be used in electrical circuits. Inefficiency of all-in-one recycling: The latest fad in recycling is all-in-one recycling and many people think that this is the best method for recycling waste. Waste materials such as paper, glass, plastic and metal all go into one bin. They are then sorted in recycling plants. People say that this is a great method as it requires fewer waste collection vehicles, minimizing toxic emissions into the air. However, sorting out all the different wastes requires machines designed to do the job efficiently. The production of these machines causes much more pollution than trucks that have to pick up the waste materials. Simply dumping your waste into recyclable and non-recyclable bins is not going to make much of a difference in cleaning up the environment. A lot of thought needs to go into how these materials can be recycled in plants and factories without causing any more damage to the planet. 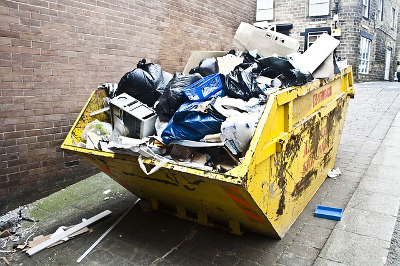 This entry was posted in "The More You Know" on Tuesday, January 13th, 2015 by 24/7 Waste Removal.